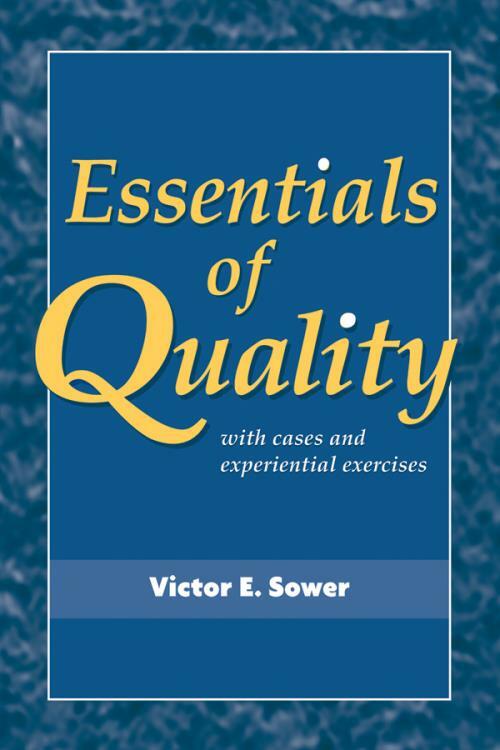 Thoroughly tested and used by students and proven to help students taking the American Society for Quality s Certified Quality Improvement Associate exam,Essentials of Quality is highly accessible, experiential, and unique in its coverage of current quality management topics, from creative and innovative improvements and approaches to today s economic environment to ways of developing metrics for measuring and evaluating programs. With non–academic, reader–friendly writing, the text features many chapter exercise and cases that provide students with hands–on experience. Chapter 1 Introduction to Quality. Different Approaches to Defining Quality. Five Approaches to Defining Quality. Major Contributors to Our Understanding of Quality. Case Study 1.1: The Battle of the Gurus. Chapter 2 Strategic Quality Management and Operationalizing Quality. Approaches to Monitoring Progress toward Strategic Goals. Methods of Obtaining Input from Customers. Focus Groups and Surveys in Combination. Case Study 2.1: Second National Bank. SECTION II QUALITY OF DESIGN. Chapter 3 Designing Quality into Products and Services. Reliability Life Characteristic Concepts (e.g., Bathtub Curve). Modeling Product Life with Normal Distribution. Risk Assessment Tools and Risk Prevention. Case Study 3.1: Building the Better Mouse. Chapter 4 Innovation and Creativity in Quality. Breakthrough (Radical) Improvement versus Incremental Improvement. Elements of a Creative Organization. Tools and Techniques for Increasing Organizational Creativity. The Importance of Technological Forecasting. Case Study 4.1: Smallburg Community Bank. SECTION III QUALITY SYSTEMS TO ASSURE CONFORMANCE TO DESIGN. Chapter 5 Quality Systems and Quality Systems Auditing. Elements of a Quality Management System. Malcolm Baldrige National Quality Award (MBNQA). Specific Types of Quality Audits. Performing a Quality System Audit. Making Data Useful Information Flows. Case Study 5.1: The First Audit. Chapter 6 Product, Process, and Materials Control. Classification of Quality Characteristics and Defects. Identification of Materials and Status. Materials Review Board Criteria and Procedures. Case Study 6.1: The Case of the Missing Lot. Taguchi Methods of Experimental Design. Case Study 7.1: The Case of the Variable Laminates. SECTION IV CONTROL AND IMPROVEMENT OF QUALITY. Chapter 8 Quality Improvement Tools. The Seven Tools of Quality. Approaches to Continuous Quality Improvement. Case Study 8.1: Sour Grape Ice Cream. Case Study 8.2: The Westover Wire Works. Chapter 9 Metrology, Inspection, and Testing. Case Study 9.1: Somebody s Got a Problem. Chapter 10 Statistical Process Control. Concept of the Control Chart. Patterns Leading to Modifying Control Limits. A Special Form of the x–bar Control Chart for Short Production Runs. Control Charts for Nonconforming Units. Control Charts for Nonconformities (Defects). Case Study 10.1: Middle County Hospital. Case Study 10.2: Precise Molded Products, Inc. When Acceptance Sampling is Appropriate. Assessing Risk in Sampling Plans. Case Study 11.1: The Turkell Stud Mill. The Categories of Quality Costs. The Goal of a COQ System. COQ Data Collection, Interpretation, and Reporting. Integrating Quality Costs into the Quality Improvement System. Case Study 12.1: HI–HO YO–YO, Inc..
Case Study 12.2: Acme, Ltd..
Chapter 13 Human Factors in Quality. Barriers to Quality Improvement Efforts. Integration of the Classic Motivational Theories. The Care and Feeding of Teams. Organization and Implementation of Quality Teams. Principles of Team Leadership and Facilitation. Who Makes up a Team? Roles and Responsibilities of the Team Leader. Roles and Responsibilities of the Team Members. Roles and Responsibilities of the Facilitator. Critical Action Items in the Team Life Cycle. General Information and Guidelines for Teams. Team Dynamics Management and Conflict Resolution. Case Study 13.1: Tom s Team. Case Study 13.2: Self Directed Work Teams at BHI. Appendix A Table of Four–Digit Random Numbers. Appendix B Standard Normal Distribution Table.